(220 V - 660 V) available on request. 50 Â± 5% 25 HZ to 60 HZ available on request. Class F Class 'H' can be given on request. Continuous (S1) Intermittent duties available on request. 450C/750C. Higher Amb. upto 600C on request. 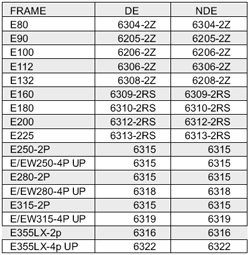 IP55 - Frame E 160L to E 200 L.
ERTL / CCOE (PESO) / DGMS approvals as a standard feature. For BASEEFA approval please contact nearest branch office/works. ⇒ High pressure mine ventilation fans with plug & socket arrangement. ⇒ Auxiliary mine ventilation fans with rod mounting / flange mounting. ⇒ Belt conveyors and armoured face/ chain conveyors. ⇒ Haulages (squirel cage and slipring motors). ⇒ Mud agitators & mud pumps. ⇒ Plug & socket arrangement (30 to 300 Amps, 650 & 1100V) forunderground equipments. ⇒ Special RV/RA for slipring motors. ⇒ Standard position on right hand side viewed from driving end side except in frames E 80, E/EW 315 L & E 355 LX where it is on top. ⇒ Terminal box on top on specific request. ⇒ Spaciously designed for accommodating bigger cables. ⇒ Double decker terminal arrangement for easy termination of two cables. ⇒ For slipring motors, separate terminal box for stator & rotor terminations provided. Stator terminal box is on left hand side while rotor terminal box is on right hand side, viewed from driving end. ⇒ Conduit plate is provided as standard while sealing box provided for group I gases. ⇒ Separate terminal box for auxiliary terminals (space heaters, thermisters) for frame 225 and above on request. ⇒ Fully non hygroscopic thermosetting moulded glass filled compound. ⇒ Increased clearances & creepages. 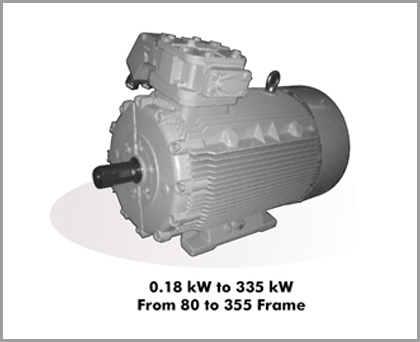 A complete range of Crompton Greaves flameproof squirrel cage motors for gas group IIC is now available for Indian Industries as an import substitute. The motors are manufactured as per the most stringent requirements for IIC atmosphere. The motors are duly tested at ERTL. For more details, please contact our nearest branch office / works. * STANDARD Temperature class T4. Other classes available on request. CENTRAL MINING RESEARCH INSTITUTE, DHANBAD. DIRECTORATE GENERAL OF MINES SAFETY, DHANBAD. CHIEF CONTROLLER OF EXPLOSIVES, NAGPUR. DIRECTORATE GENERAL FACTORY ADVICE SERVICE & LABOUR INSTITUTE, MUMBAI. BUREAU OF INDIAN STANDARDS, NEW DELHI. BRITISH APPROVALS SERVICE FOR ELECTRICAL EQUIPMENT IN FLAMMABLE ATMOSPHERES, UK. 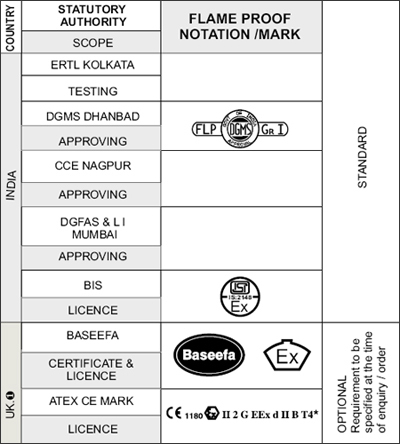 NOTE:* Motors as per UK based standards can be supplied against specific enquiries.